I first met Kimo Wall Sensei when he came to Puerto Rico to do a round of exhibitions at the local University. 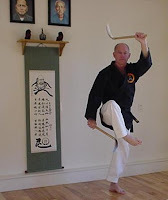 I was still a lowly white belt in the Ochoa Dojo and knew nothing of the internal politics waging in the Shoreikan School of Goju-Ryu that I was to know much later. It couldn't have made much difference, it was all karate to me then, and is still now. I was duly impressed, not only technically, but by his manner of being; I knew I was in the presence of a true teacher. Kimo is a very charasmatic guy, a little showy (a lot of sensei are) but sincere. All the sensei in the dojo had started with him although they made shodan with Shinoda. So for a week the dojo became a rehearsal studio for the exhibition. Katas were assigned to the different senior belts, groups katas assigned to green belts, and kids were given various routines. My sister was recruited to the female greens and had to learn a "dance kata" to music. I was not chosen for anything, which was all right by me since stage fright would have rendered me a zombie. I was proud that my sensei Gusi González was chosen to do a sanchin while Kimo broke slits of wood on various parts of his deceivingly skinny anatomy. The goal was to seek new members and in this it was a success. It all ended with Kimo and the black belts demonstrating various Kobudo katas which is something I had never seen. What I didn't know then was that Kimo was vying for the dojo since there seems to have been a break in the Shoreikan organization and Kimo was to go on and form the Kodokan school. I was to eventually train with Kimo although I was completely unaware that it was another school. In fact, I would also eventually study in Kow (Kayo)Loon Ong's Chi-I-Do, another who split from Toguchi over Tamano. Politics...politics. I learned great things from all my sensei, in that sense I was privileged. But Kimo was special, I guess he was my true sensei, although I trained with him the shortest time of all. A true sensei is more than a guy who teaches you karate, gives you a belt, or checks your sanchin. A true sensei invades your whole life, leaves an imprint in your soul.